Sitka is one of the prettiest towns in one of the prettiest settings in Southeast Alaska, and we have enjoyed seeing the well-kept houses, some of which are historic, and the lovely gardens. At one time Sitka was the busiest port on the entire west coast of North and South America, and today the port remains one of the busiest sea ports in the United States. In fact, Sitka was ranked ninth largest by size and fifth largest by value of the seafood harvest. Sitka is also the cultural center of Southeast Alaska, and we were surprised with the offerings for a town this size. The Sitka Summer Music Festival brings an impressive line-up of classical musicians to the town for a month-long series of chamber music concerts. Unfortunately, we just could not work one into our overloaded schedule. While we were in town, the Sitka Fine Arts Camp kicked off its summer season. The camp offers classes in visual arts, music, theater, dance, writing and Alaskan Native arts to students from throughout Alaska and the United States, as well as a few foreign countries. We met one of the Native instructors who explained to us a little bit about the camp and how popular, and important, it has become both to the town and to Alaska. Sitka National Historical Park, where Tim and I worked, also preserves the culture and traditions of Alaskan Native peoples. This is Alaska’s oldest national park unit, and it has an interesting history of its own. In 1905 Governor John Brady selected Sitka as a location to display a collection of totem poles that had been donated by villages throughout Southeast Alaska. These totem poles had been displayed at the 1904 Louisiana Purchase Exposition, as well as the 1905 Lewis and Clark Centennial Exposition, and are now the highlight of what is often called Totem Park. The totem poles are located along a two-mile loop trail that winds its way through a temperate rain forest. Many are replicas of the earlier poles, but several original poles are on display in Totem Hall in the visitor center. The visitor center also houses the Southeast Alaska Indian Cultural Center, which offers demonstrations of traditional Alaskan Native arts. Artists demonstrate their work here, and we were fortunate to see and talk with several artists during our three weeks at the park. We also visited the Sheldon Jackson Museum, which is world-renowned for its rare collection of nineteenth century artifacts from all Native groups in Alaska. These items were collected by the Reverend Dr. Sheldon Jackson, who was a Presbyterian missionary and educator. Jackson recognized the importance of preserving historic, cultural and natural history items so that they could be studied and enjoyed by future generations. The museum is the oldest in Alaska, and it still retains its old-fashioned flavor. 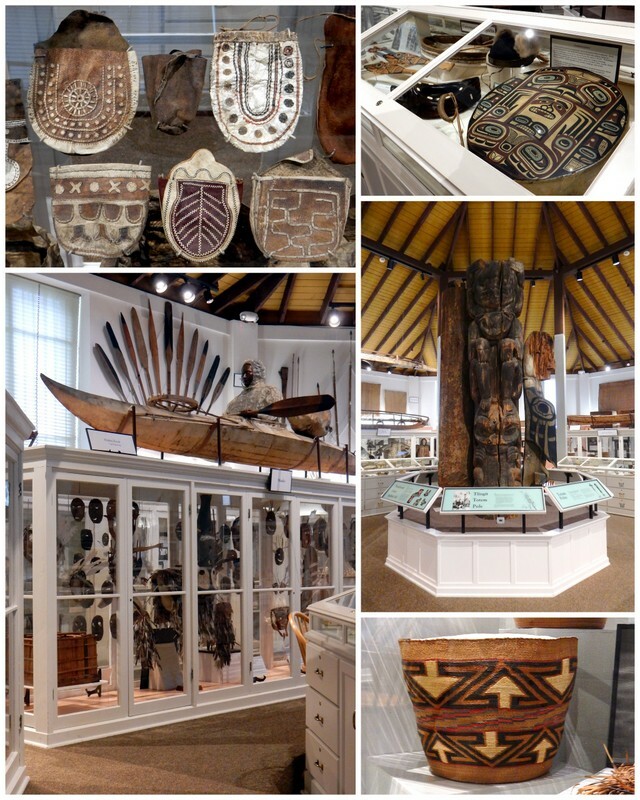 The objects displayed here are simply amazing and range from Eskimo masks and Aleut skin-covered watercraft to Athabascan baskets and Haida argillite carvings. After witnessing dozens of bald eagles flying over Sitka, we decided to pay a visit to the Alaska Raptor Center, Alaska’s only full-service avian hospital and educational facility. 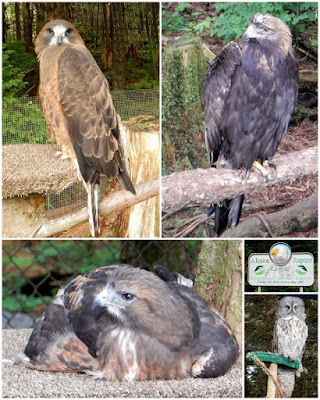 Although it was very cool to see the various raptors up-close, my favorite part was listening to the commentary of our tour guide, who spoke to most of the birds and described their unique personalities. Perhaps it was because we arrived very late in the day, but we were a bit disappointed with our experience at the Raptor Center and left wanting more. When I had visited the center on an earlier trip to Alaska, I had been impressed with the gloved-bird program. Maybe that is available only to groups. Without that program, I didn’t feel the $12.00 entrance fee was a good value for us. I’m glad we had an Alaska TourSaver two-for-one coupon to use here. Our admission fee did go to a good cause, so we were ok with that. Tim and I also had an opportunity to reconnect with old friends while we were in Sitka. One of Tim’s former colleagues at Rocky Mountain National Park has been working at Sitka National Historical Park for the last five or so years. It was Becky who passed Tim’s name to Kelsey, the museum curator, which led to Tim’s contract at the park. Becky and her husband Marcus invited us to their house for dinner, and we had a lovely evening with them. As I’ve often said, visiting old friends in far-flung places is one of the benefits of this lifestyle. During our three weeks in Sitka, Tim and I managed to check out many of the local restaurants. One of our favorites was Ashmo’s, a food truck that is often parked by St. Michael’s Cathedral. We especially enjoyed the black cod tips, a local specialty, as well as the smoked salmon mac ‘n’ cheese. We also had tasty fish tacos at Larkspur Café, and good fish and chips at the Dock Shack and Fly-in-Fish Inn. If you are willing to spend big bucks, there are two restaurants that we feel are worth the money. An unexpected find was the Channel Club, which is located a few miles west of town. I thought the white king salmon that I ordered was one of the best meals I’ve had since arriving in Alaska. This fish is relatively rare and really was almost white. The flavor is quite delicate and very different than red or pink salmon. We finally made reservations for Ludwig’s Bistro where Tim took my cue and ordered ivory (a fancier name than white) king salmon. His was also delicious. Ludvig’s is known for its Wild Alaskan paella, which I ordered, but I’d probably select something different next time. I’m really glad it was Sitka where we ended up for a three-week stay. Although we have enjoyed every town we’ve visited in Southeast Alaska, Sitka is one town that I’d return to again and again. We finally left Sitka last Sunday afternoon and cruised to Juneau on the fast ferry. Since the route was just the reverse of the route to Sitka, I didn’t feel compelled to take additional photographs, especially since day was overcast and the light was less-than-ideal. We arrived back in Juneau without incident and headed directly to Mendenhall Campground where we had stayed previously. This time we picked a site with no hookups, and what a site it was! The site was bigger than huge, and it was located on the lake. We even had a view of Mendenhall Glacier through the trees. We only stayed for two nights, since our stop in Juneau was just to restock the RV, but this would have been a perfect place to spend a week. Bright and early (too early!) on Tuesday morning, we boarded another ferry for Haines – our last ferry ride of the summer. I’ll cover our time in Haines in the next post. Your words aptly describe your pleasure in your stay in Sitka. So great that there was so much on offer ... and you certainly managed to do quite a bit considering you were working on the cataloguing project. Thanks Erin. Sitka does have quite the variety of things to do and places to see. We spent our last Saturday trying to fit in a few last-minute stops. It was worth it! I am so enjoying your visit to Alaska and really getting the bug to visit real soon:) What a great place to do some work and spend a few weeks. I'm not a museum person in general but I am looking forward to seeing the museums along the way when do get around to visiting this state. I love seafood and especially salmon. I do believe I will be in heaven there:) I was surprised to learn the fish in your photo was salmon! What a gorgeous plate. Glad it tasted as good as it looked. Looking forward to the rest of your journey. Safe travels! I think the two of you would be in heaven in Alaska. We haven't done any hiking here, but there are so many opportunities that I think you would enjoy. And, yes, the seafood is divine! That's all I seem to order here, and it's all been excellent. The white king salmon was a real find.